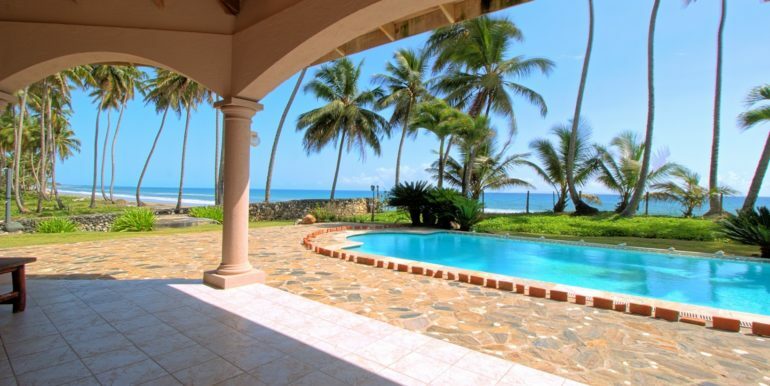 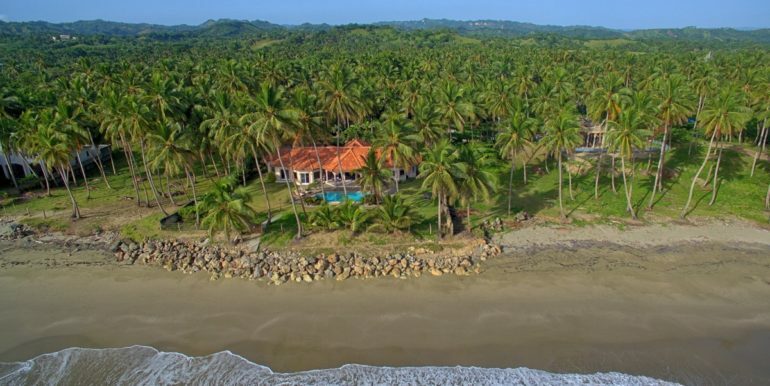 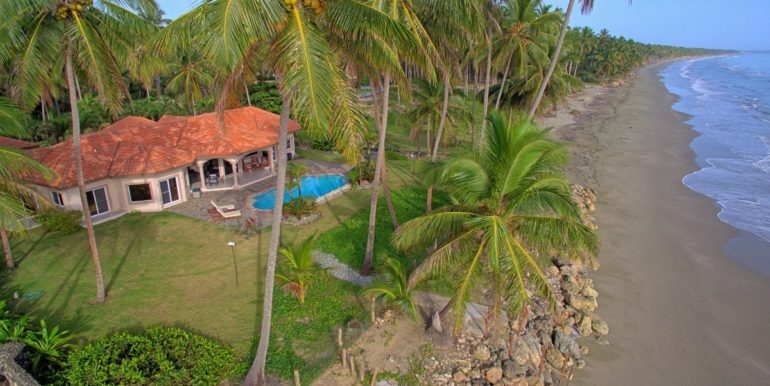 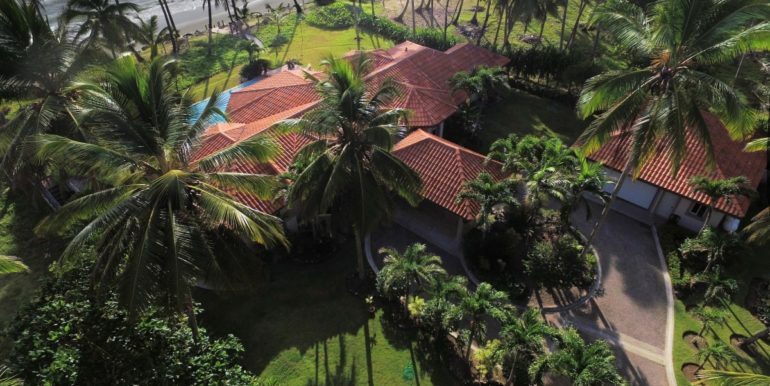 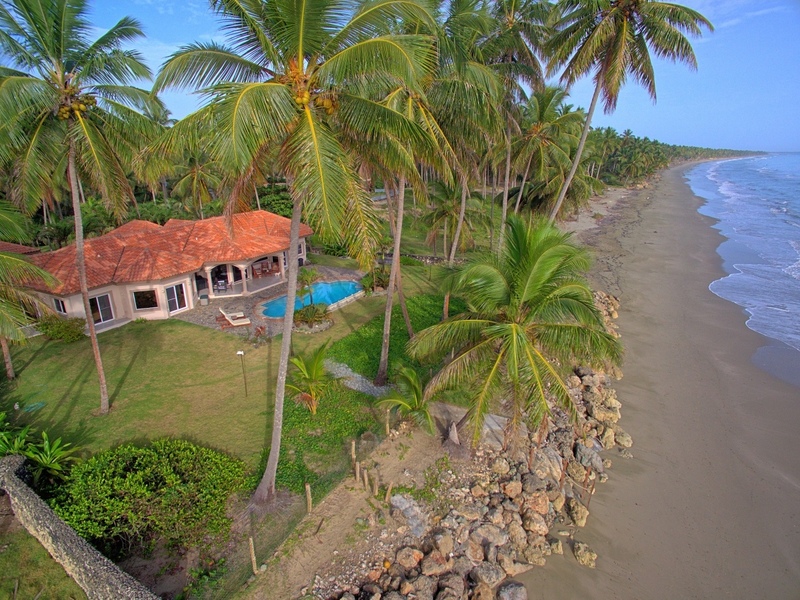 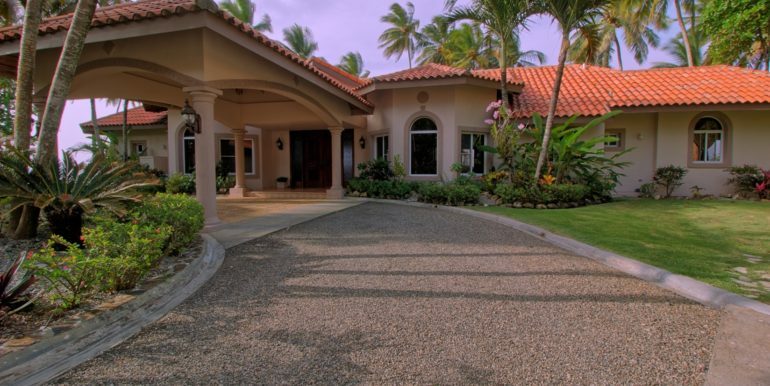 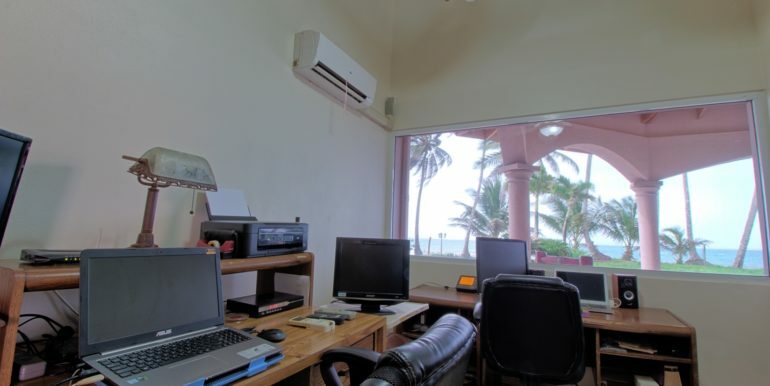 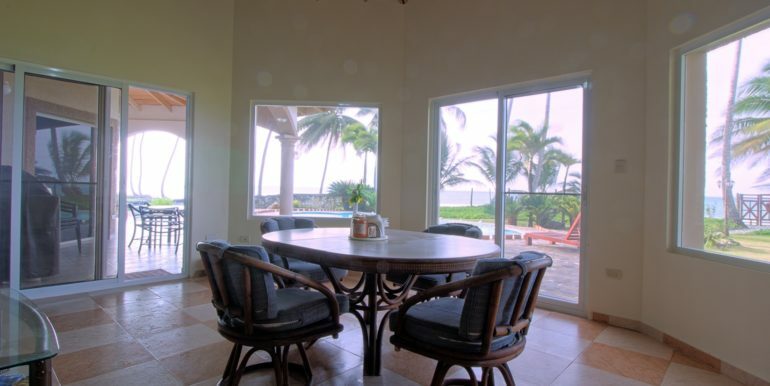 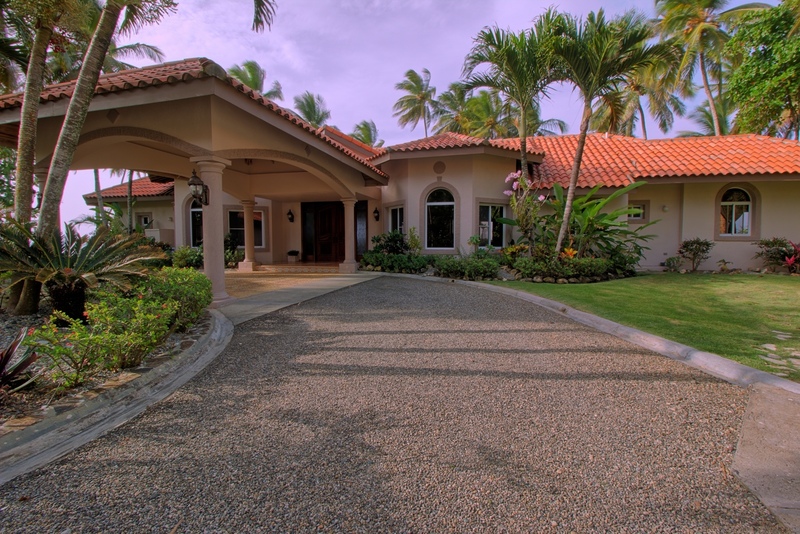 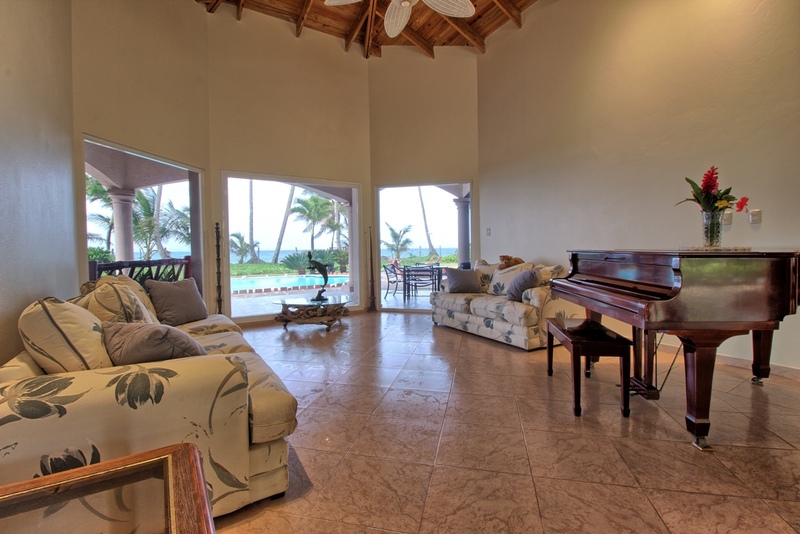 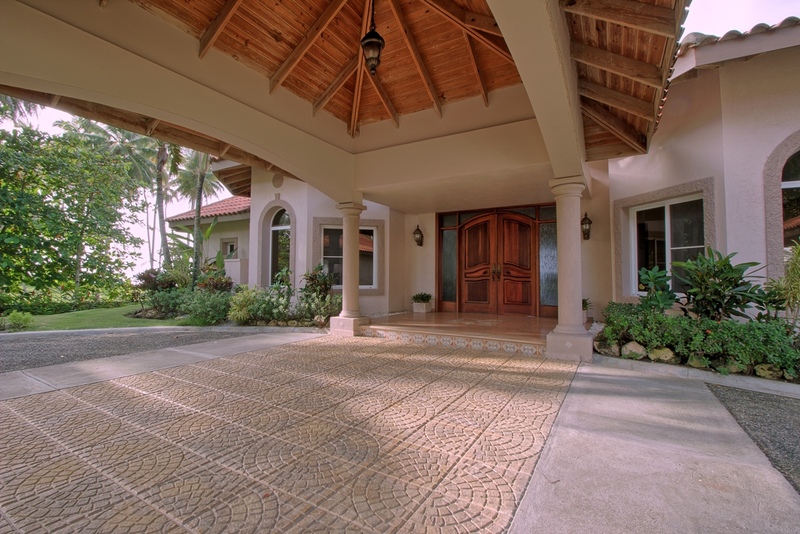 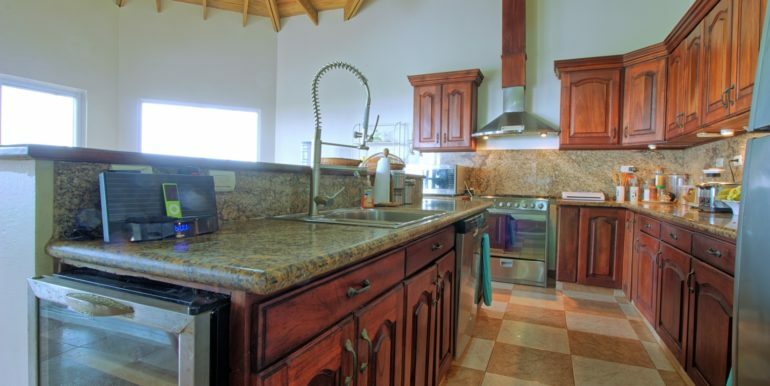 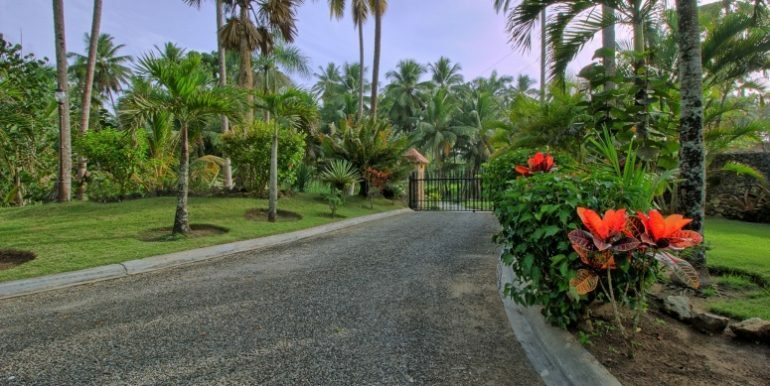 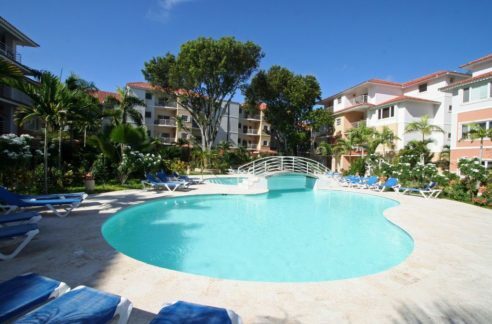 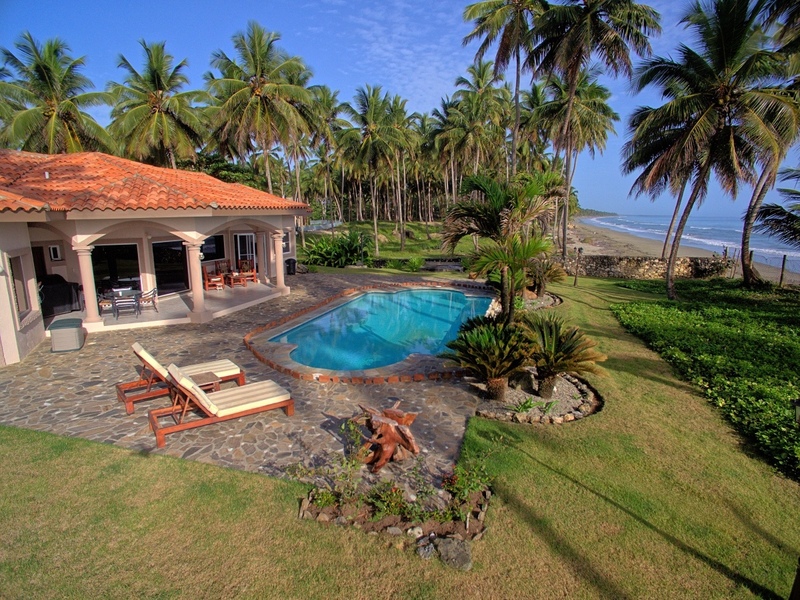 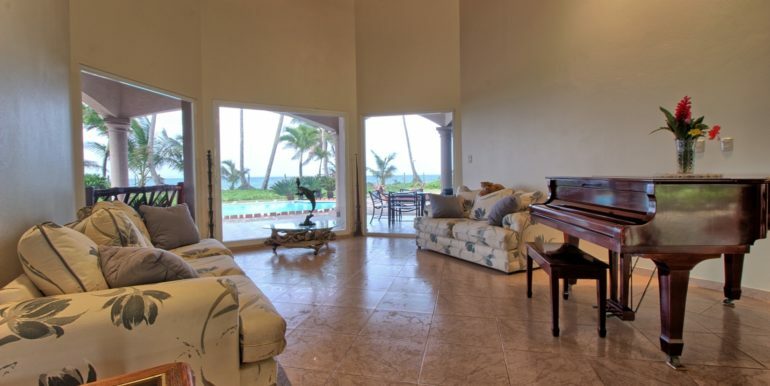 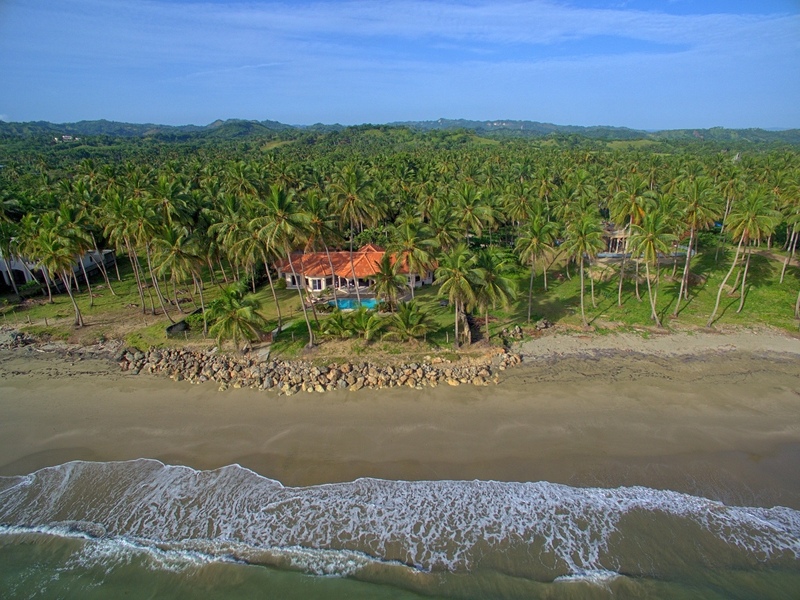 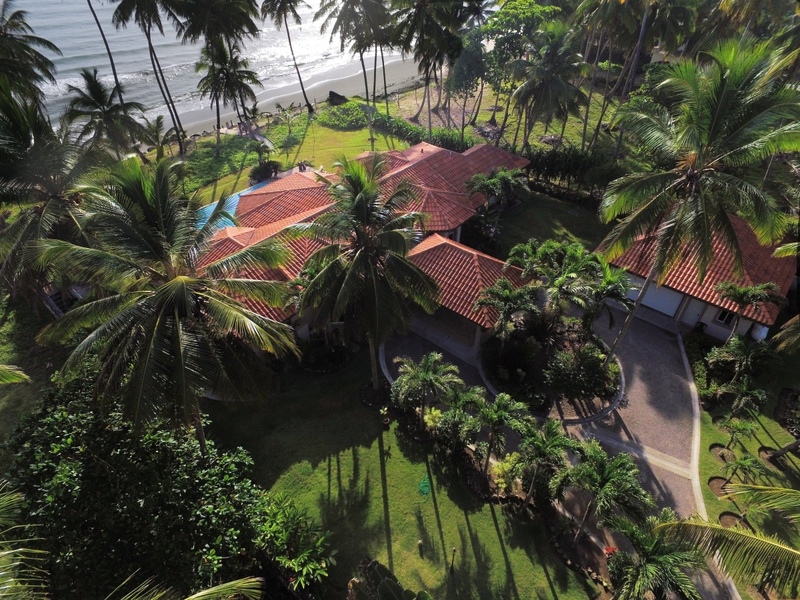 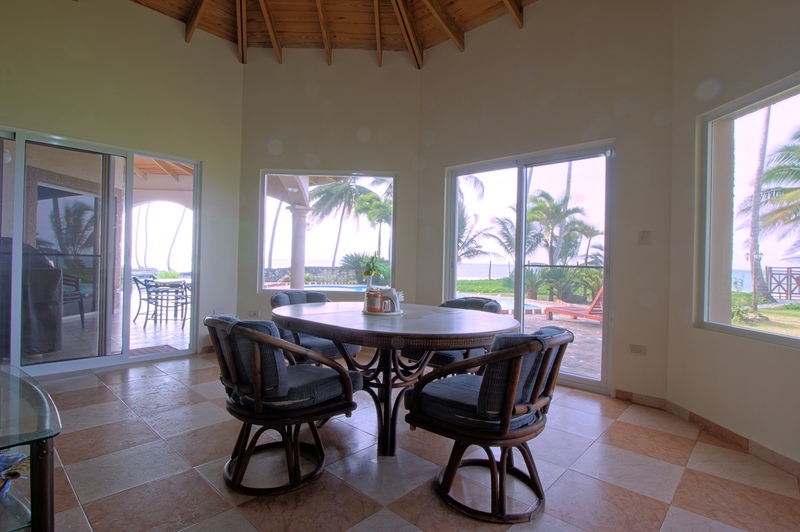 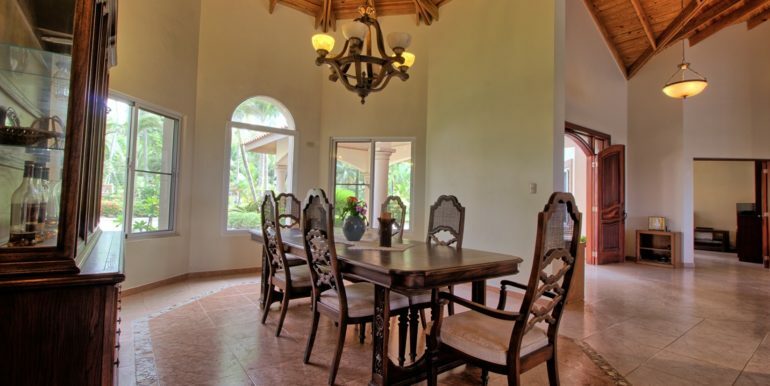 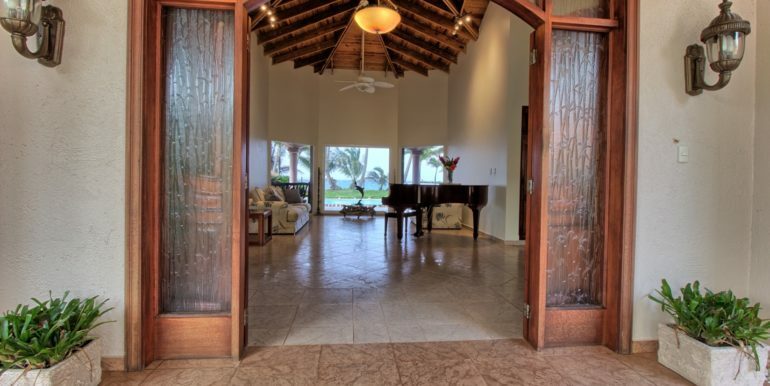 This beach front villa for sale in Dominican Republic offers a quiet, serene location. 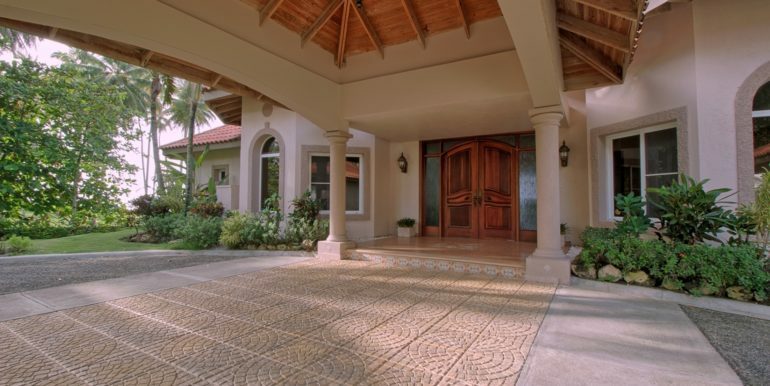 Built in classic Mediterranean style, the one-story floor plan makes an excellent distribution of living space inside, and outside. 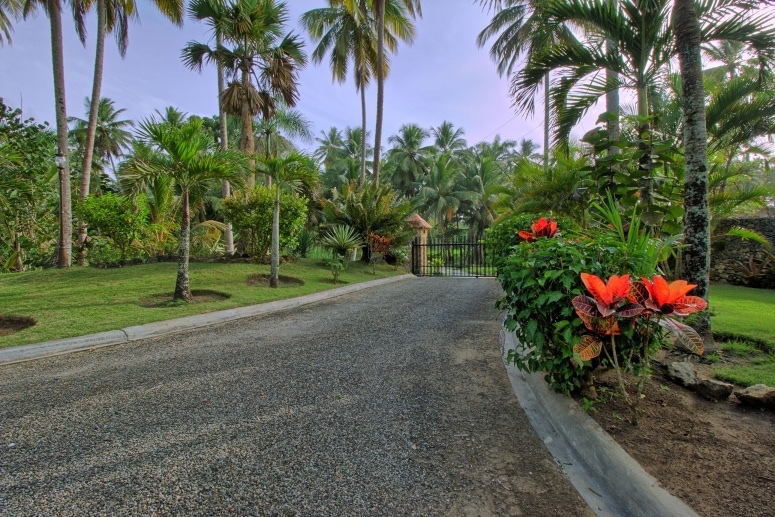 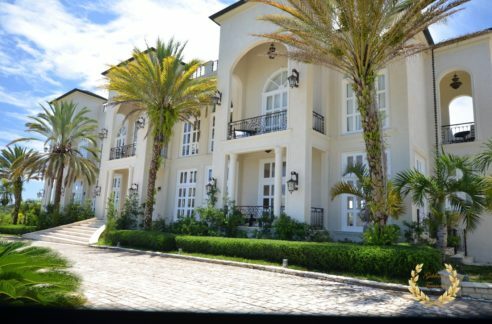 Upon arriving, guests will be driven along the driveway, flanked by palms and other garden trees until they reach the large Doric portico that precedes the foyer. 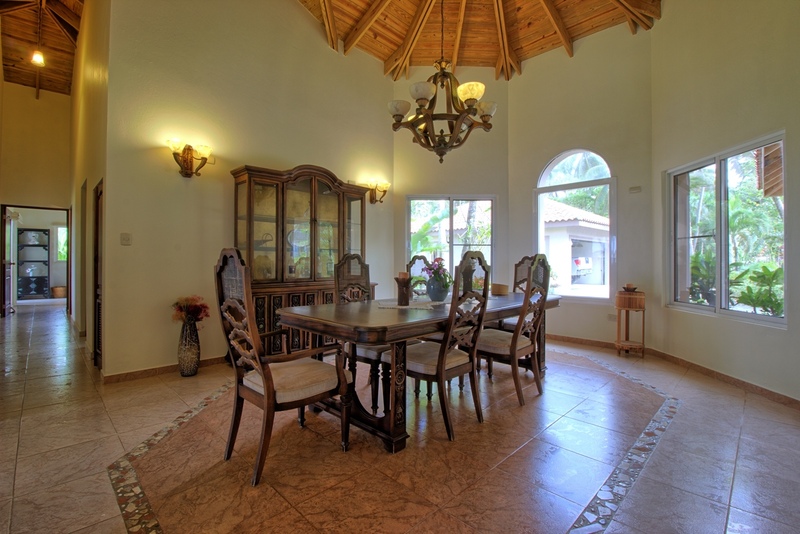 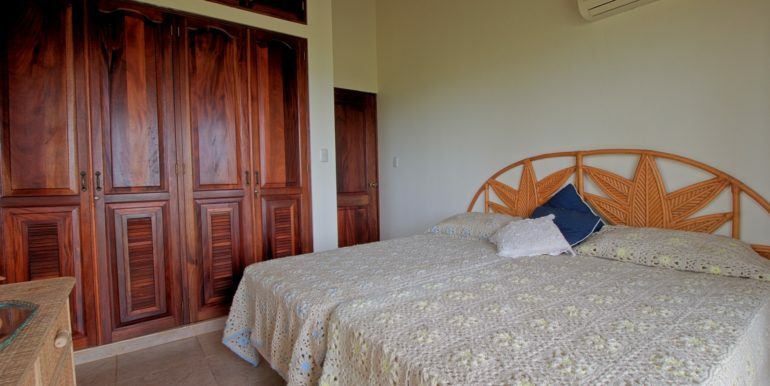 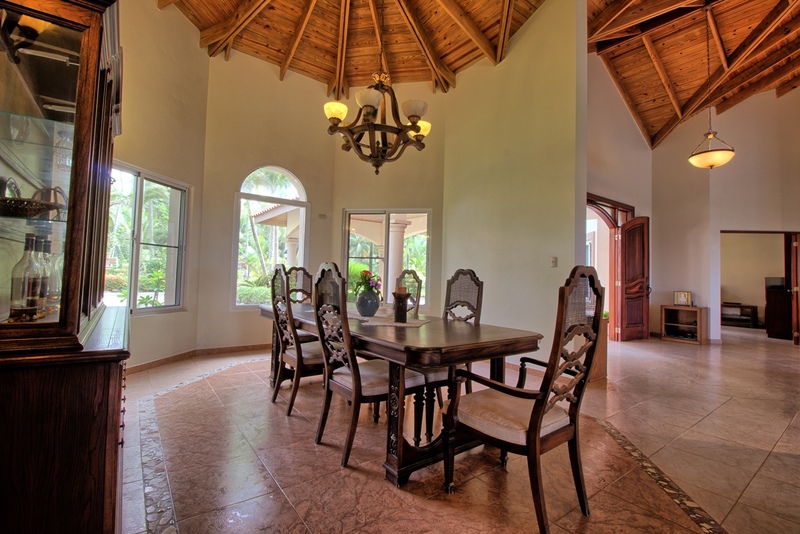 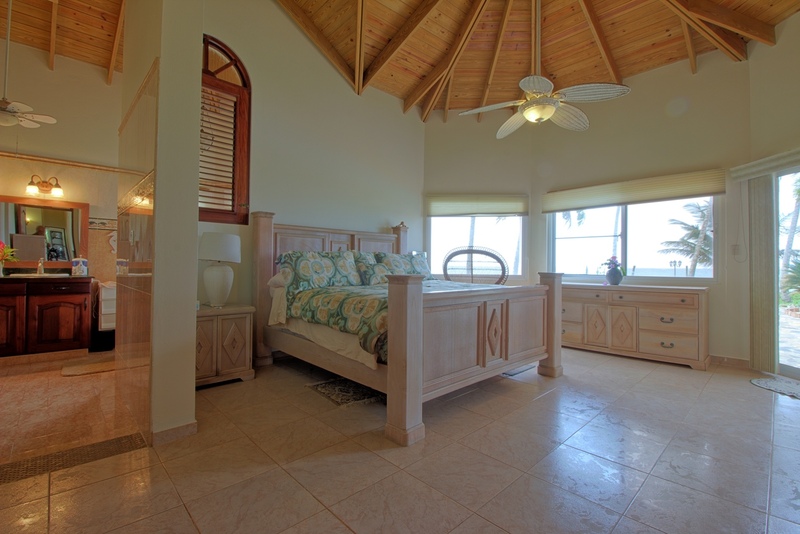 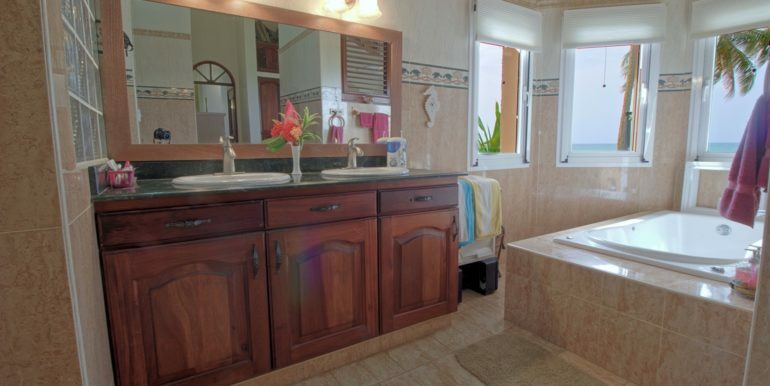 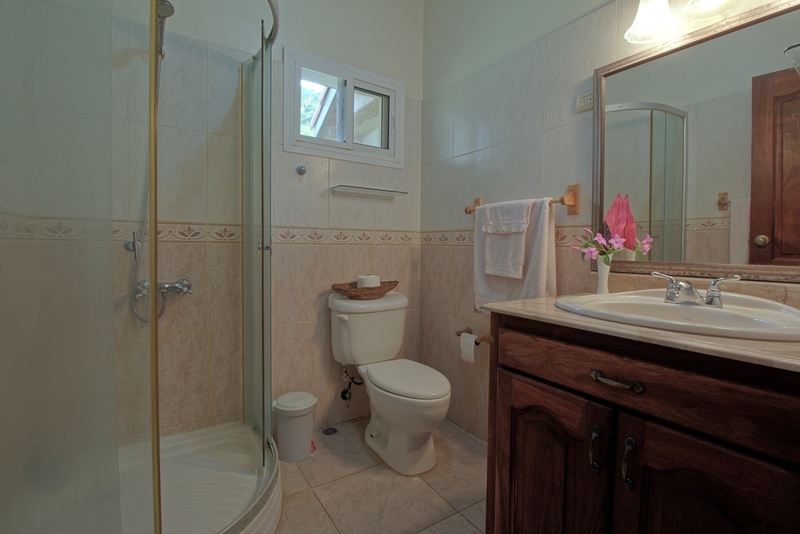 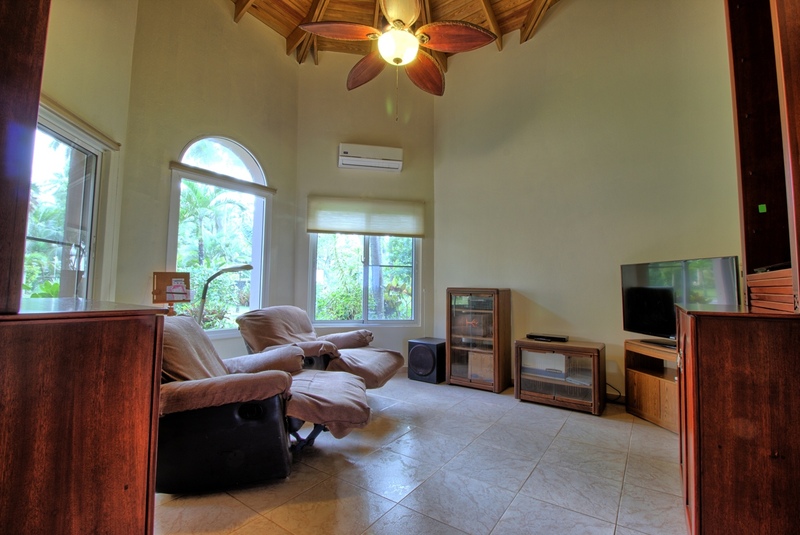 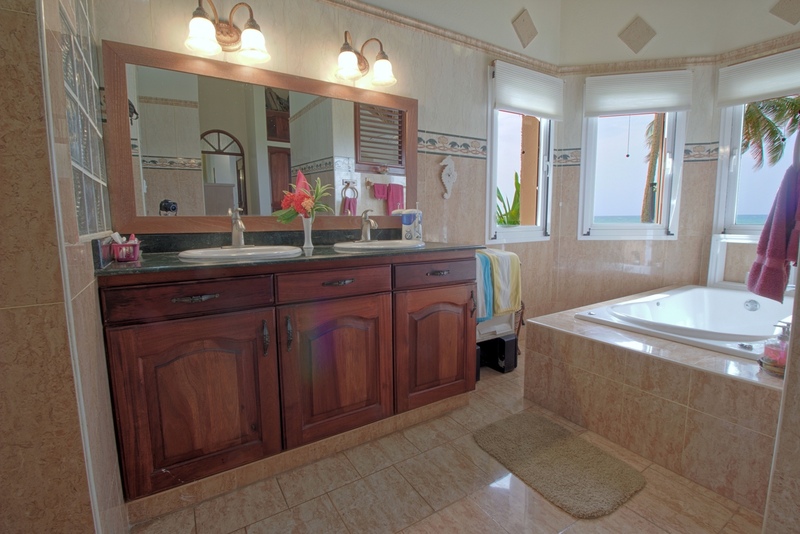 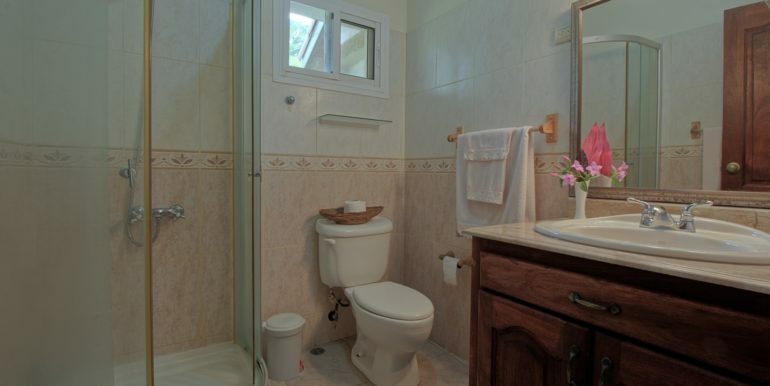 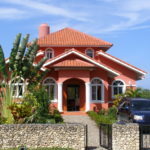 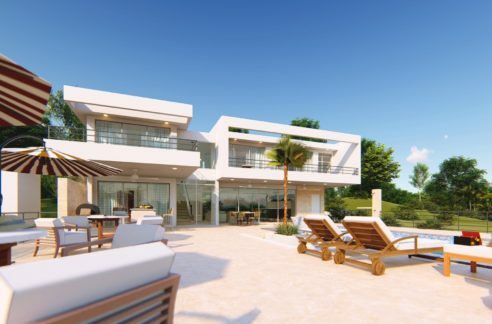 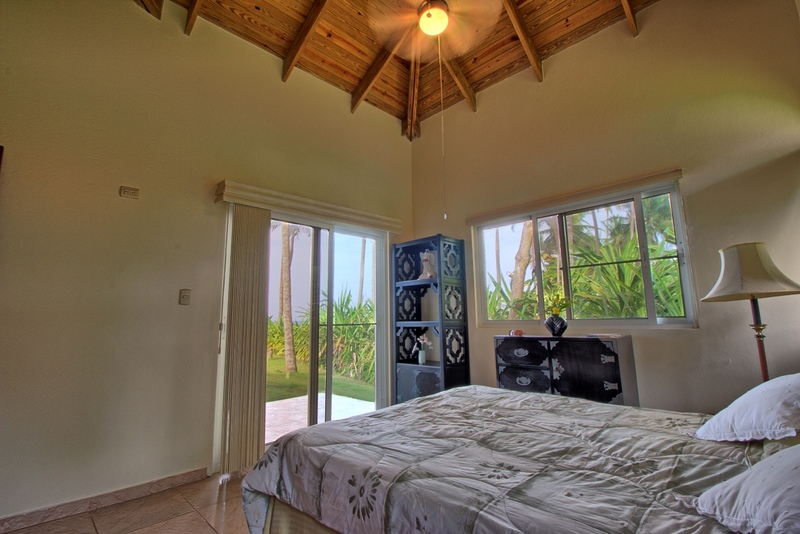 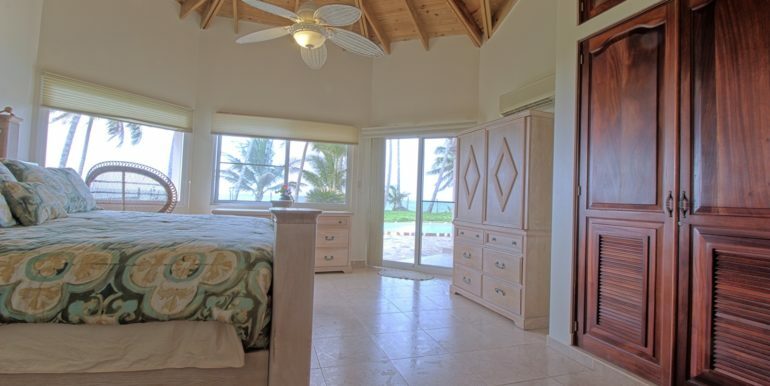 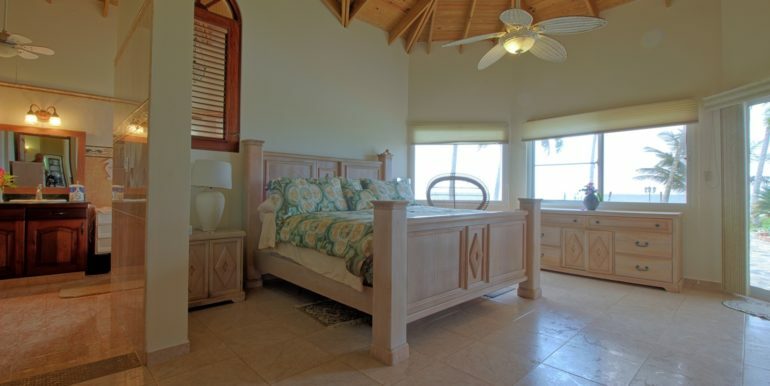 The villa has 3 bedrooms and 2 -1/2 bathrooms, elegantly decorated with high end finish materials. 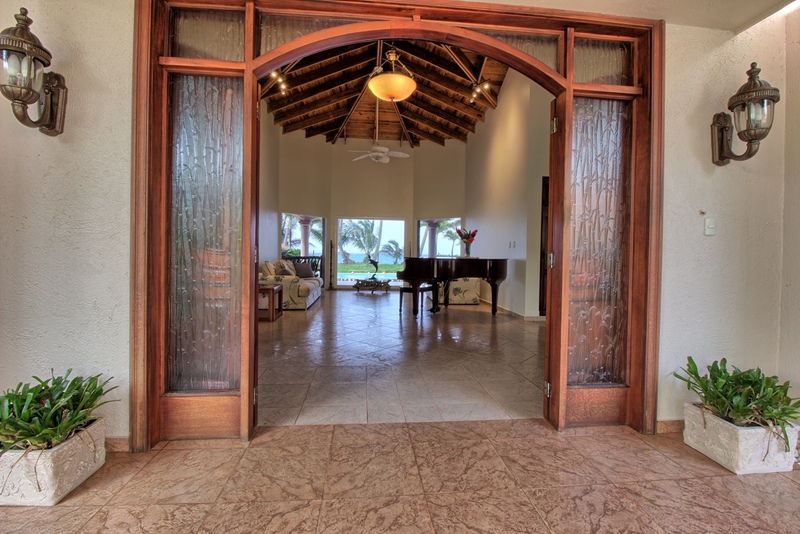 The cathedral wooden ceilings add a special and practical effect to the overall home, which boasts a center family room with grand piano and tall glass windows facing the swimming pool area. 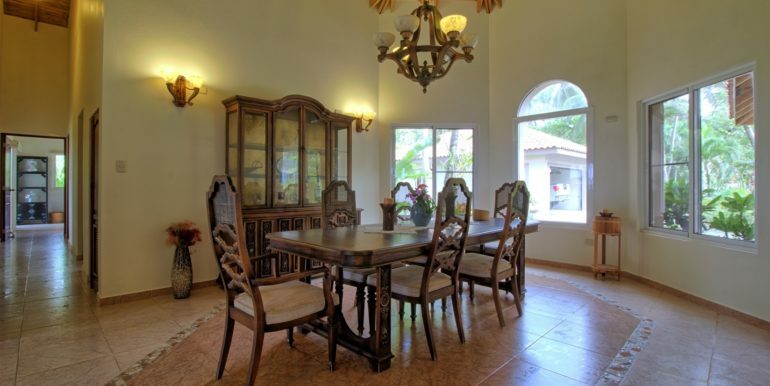 To the right side, a dining room with vintage style dining table and cabinet allows the view of the front garden area through the multiple display windows. 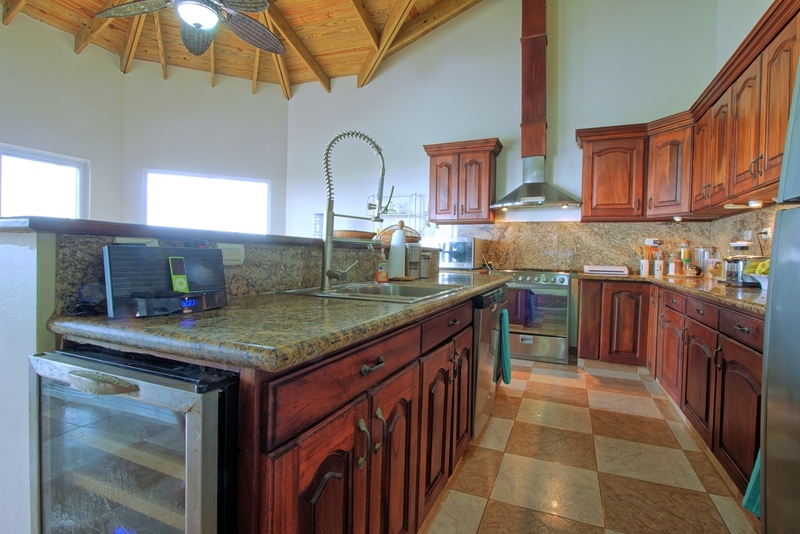 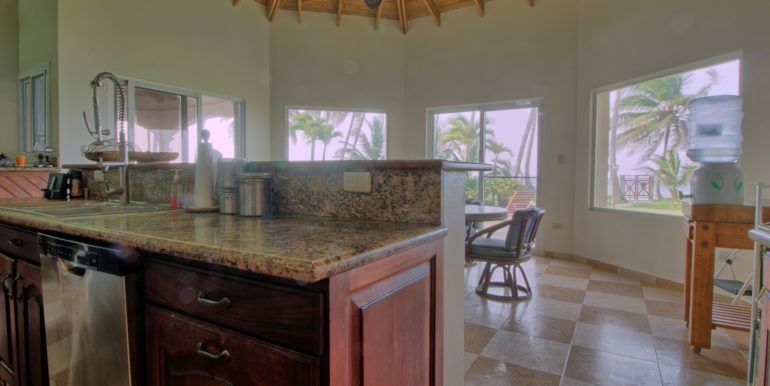 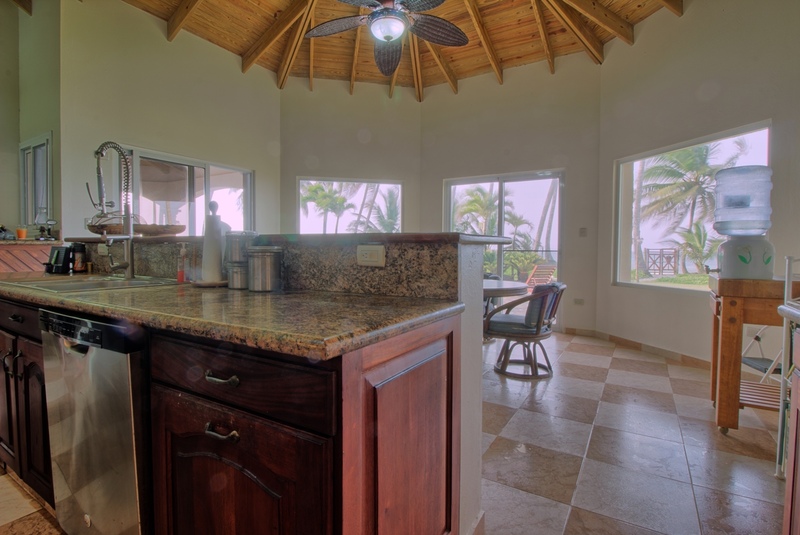 Further right, an exquisitely designed kitchen with large center island, checkered flooring and imported granite tops includes a dining area facing the beach. 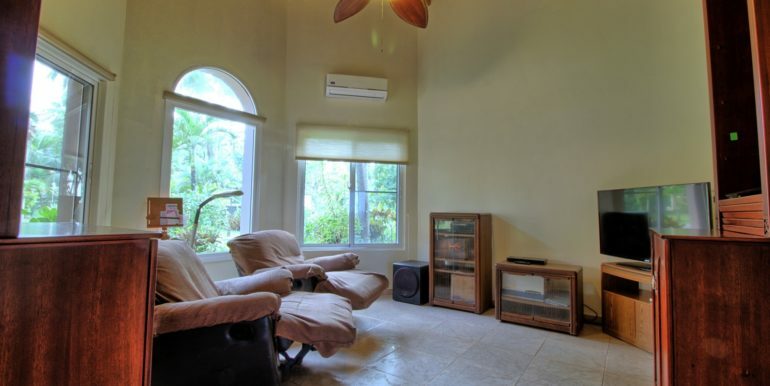 A den with large TV, stereo equipment and lazy sofas also includes A/C, also allowing exterior views. 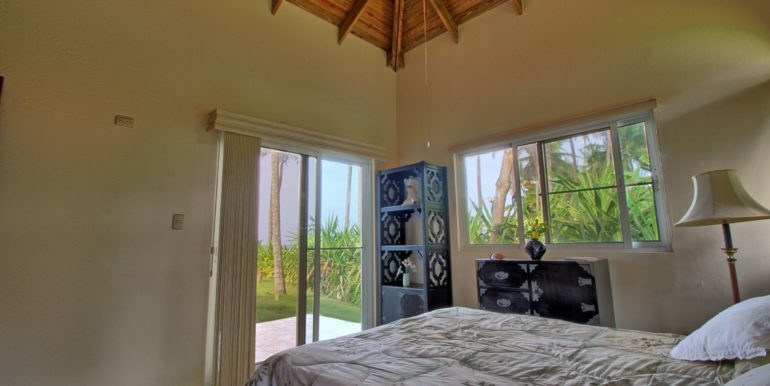 Of the three bedrooms, the main suite is the most spacious one, boasting excellent vistas of the sea side and swimming pool area from several glass windows and a tall glass door. 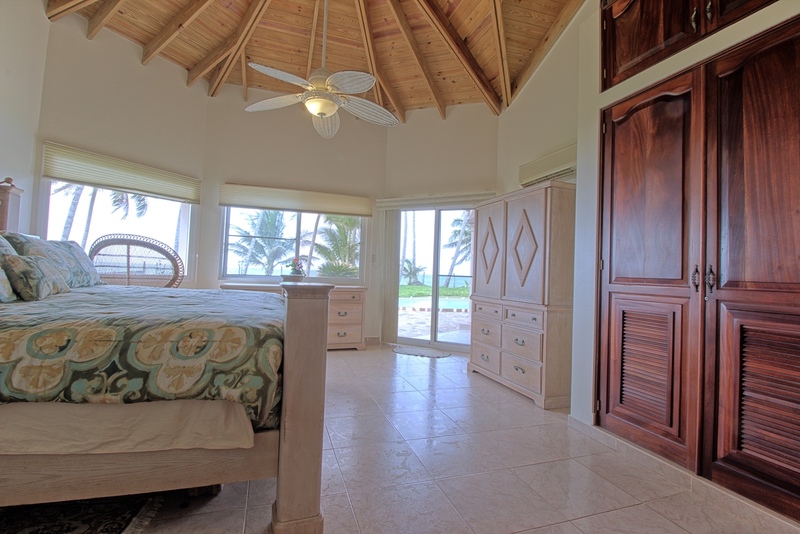 Its walk-in closet provides plenty of space, and its master bathroom bears a distinctive design that includes a Jacuzzi and double vanities facing the beach view. 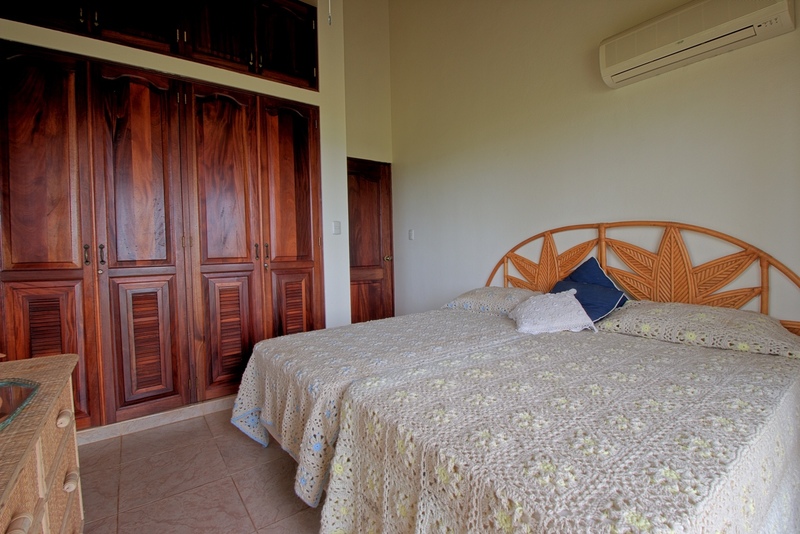 The guest suites are also spacious and include air conditioning and mahogany closets. 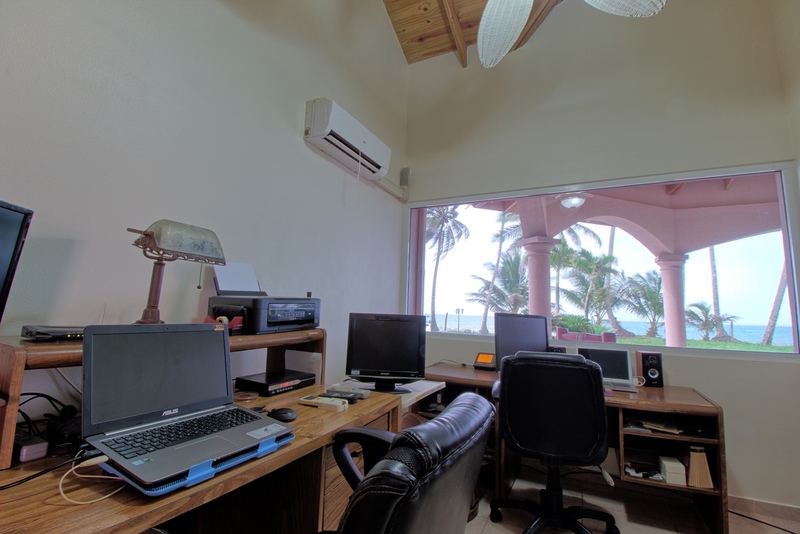 A bonus room, the office is the perfect space for those who work from home or need to stay connected to the office during their leisure weeks. 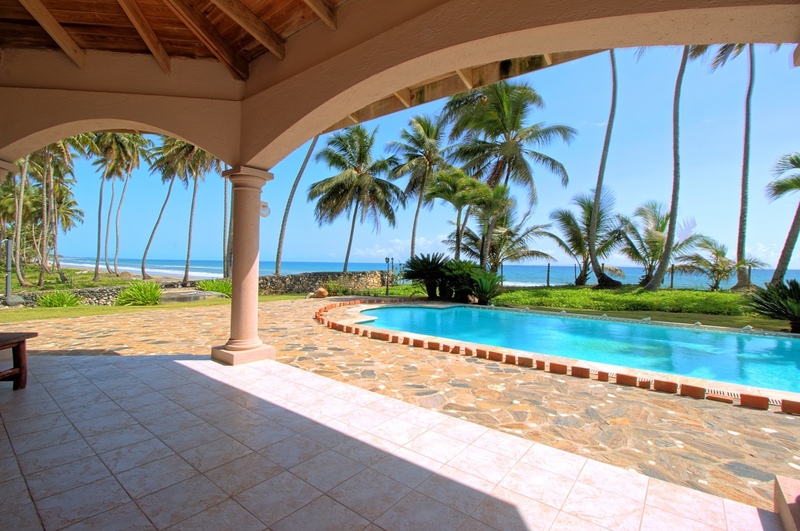 Outside, the 3,500 m2 ( 3229.173ft² ) land provides garden areas on the back of the beach house, and plenty of space on the front side by the beach. 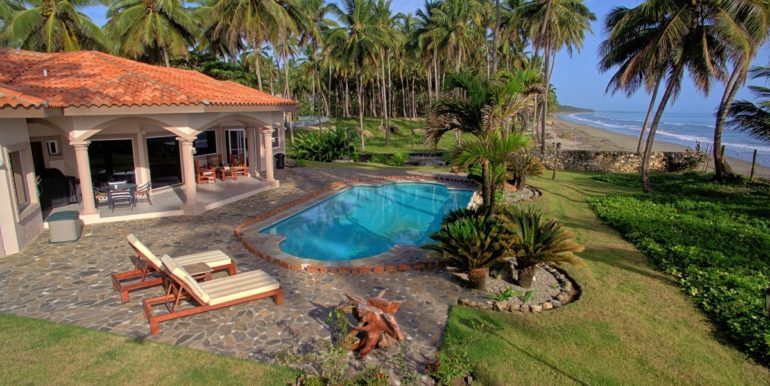 A generously sized, Roman-styled 11×22 meter swimming pool sits between the beach and the villa, with natural rock deck and lush green garden plants.